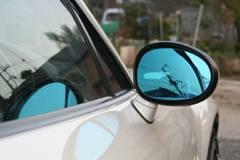 Joy Fast blue side view mirrors MAZDA - MiataRoadster - Stay tuned with MiataRoadster! Joy Fast blue side view mirrors are anti-glare and are effective during night time driving. This is for replacement glass only, not housings.